My Audrey Hepburn, shot with a mirror behind her, the line that divides mirror and wall was erased via photoshop. Additional shadows where also placed via photoshop. I thought photographing the dress and showing its back would be more appropriate, after all it is a Givenchy-inspired dress. 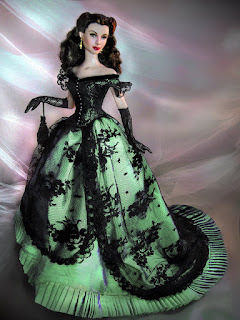 This is another gown done by Alana Bennett inspired by the TV Series "Scarlett" (Alana gave me additional gloves, hooped skirt, pantalets and a night purse with ribbon, that's how generous she is). The dress is actually blue. I changed the color in photoshop via the "Replace color" function. The background is a draping of multiple layers of tulle. The doll stands on a grey table. This photo was taken today, beside the window. Here is where available light is used to shoot the subject. I added more light in photoshop thru the "brightness/contrast" tool, as well as enhanced the saturation of the color. Doll's hair has been photoshop-ed to take out flyaways (those little strands). This is where it all began. I had one yellow light lamp source and nothing more. The Franklin Mint Scarlett has not been retouched. I wanted her seated with an overflow of layers in her gown on the floor. She reflects light very well. 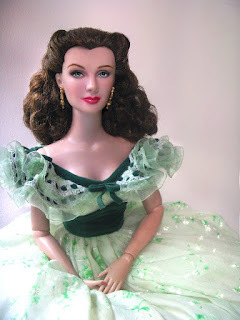 This is my Timeless Treasures Scarlett by Mattel. She also photographs well. Light and shadow fall well on her sculpt. I added some "divine light" there thru photoshop. Notice that the draping of the dress as well as the accessories have been arranged to capture light and shadow. Doll portraiture seems to be my favorite pastime. Not that I have too many dolls (they are very expensive and can take up so much space) mostly GWTW dolls seem to occupy most of my space and time. I knew for a fact that dolls may not last. Time will tarnish the pristine quality by which we came to first know them. So, by accident, while sick and bored I just snapped a shot of my Franklin Mint Scarlett. I had but one lamp, nightime in my room and the doll. I was surprised how this doll was able to reflect the light well. So I did a little more shots and came up with some interesting photos (in my opinion). From then on, it was a love affair with Scarlett as my favorite model (more so now because I have one which is articulated -- but not so much as to pose her a la Sybarite). Many people ask me about tips about how I shoot dolls, so let me share what I un-professionally know. I hope it will help. 1. PREP THE MODEL: Make sure hair and dress are in place. ?Have a little toothpick to push excess strands out. Fix the fitting of the dress too. Make sure accessories: earrings, necklace and whatever are all in place and complete. It may help to tape the necklace at the back so when you pose the doll, it doesn't move around. 2. HAVE A PEG: I always check glamour shots of Hollywood in the 30's and 50's. Also I research on Vanity Fair Hollywood. Just google it up and you'll find some interesting shots by Annie Liebovitz or Richard Avedon, Steven Meisel of Vogue. BE REALISTIC. When you look for what you want, be sure you're doll can adopt the pose. Make sure you have the background for it too. Do you need drapings for the back? Velvet would be good but make sure it contrasts with the hair and the dress. I use solid colors and drape that with tulle sometimes for drama. But a good solid background is okay. 3.LIGHTING : I have 2 lamps which I can angle well to create the kind of mood for the doll. I also have a board of aluminum foil (foil: smoothened, then stuck to cardboard) to create some reflections. I never use flash when I shoot as it creates harsh shadows which are for me, are not so nice for a glamour shot. 4. CAMERA: Can you believe I originally just used a 3.5 megapixel phone camera. Now I either use an IXUS digital camera or my new phone a Samsung 5 megapixel camera. The IXUS digital camera has a connection to the computer which allows you to view and download/transfer selected shots to your desktop or files. From there you can upload to your favorite site. SHOOTING THE DOLL means knowing her best angles. The Franklin Mint doll photographs very well. 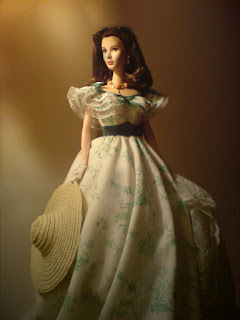 Tonner's Scarlett has to be angled to avoid the strong jaw. Shoot the doll like you're shooting a real person. FOLLOW THE RULE OF THIRDS. The Rule of Thirds is a rule that you never shoot the focal point of the photograph in the center. In my photos, I always try to put the face off center. 5. PHOTOSHOP: I learned photoshop when I was in the Publishing industry. I was Creative Director there but during my spare time would practice retouching photos of celebrities and socialites, beauty spreads, fashion spreads and even covers. I would encourage you to get a photoshop program for your computer because you can do a lot of retouching: You can take out backgrounds, put in backgrounds, fix the hair, clean up any little detail so the photo can be as beautiful as you want it to be. I use photoshop tools very minimally specifically, the "clone" tool, the airbrush tool, the liquify tool (ahhh many a skirts where fixed with that, waists made smaller too), and the filter tools: paint daubs, film grain, sketch, etc. You'll learn as you discover it one by one thru trial and error. Well that's all for now. Happy doll photoshoots to you all!